Fjords’ first Special Edition supports the art and literary community of black American authors. The edition is Guest edited by BOA A. Poulin, Jr. Poetry Prize Winner Geffrey Davis. He writes in the editor’s letter, “When I first began curating artwork for this Black American Edition of Fjords Review, I felt the expected anxiety over the dirty, unavoidable politics of choice; however, it didn’t take long for that selfish worry to be replaced by something more urgent. Suddenly, the selection process was difficult for different reasons. Suddenly, the act of editing became riskier than any personal-professional stakes of seeming to have a who’s-who editorial reach. Suddenly, worries about craft became worries about silence, and every perspective felt vital. Suddenly, I didn’t want to let any voice go—they all needed to be heard and set against the cultural narratives that continue to sanction a deadly American imagination that fears and threatens black and brown bodies.” We are proud to present this important edition to our readers. Nicole Aandahl is a creative writer by night and a corporate lawyer by day. She has a B.A. in Russian Studies from Howard University and a J.D. from the University of Pittsburgh. Nicole is married with two little kids. Malcolm Friend is a poet originally from the Rainier Beach neighborhood of Seattle, Washington. He received his BA from Vanderbilt University, where he was the 2014 recipient of the Merrill Moore Prize for Poetry, and is an MFA candidate in Creative Writing at the University of Pittsburgh. He is also a 2014 recipient of a Talbot International Award for Writing. His work has appeared or is forthcoming in publications such as La Respuesta magazine, the Fjords Review’s Black American Edition, Alicante’s Información, fields magazine, Pretty Owl Poetry, and elsewhere. Tafisha A. Edwards is a Guyanese-Canadian poet who lives and works in Washington D.C. Her work has appeared or is forthcoming in publications such as The Rufous City Review, Bodega Magazine, The Little Patuxent Review, Fledgling Rag and Stylus among other journals. She is currently one of Split Lip Magazine’s Poetry Editors, a Cave Canem fellow, a graduate of the University of Maryland’s Jiminéz-Porter Writers’ House and a former educator at the American Poetry Museum. She has received scholarships to the Juniper Summer Writing Institute, The Minnesota Northwoods Writers’ Conference and other writing conferences. She is currently penning her first collection of poetry, Confusing the Wind. Mary Moore Easter, Pushcart Prize-nominated poet and Cave Canem Fellow, is published in POETRY, Seattle Review, Water Stone, Calyx, Pluck!, Persimmon Tree and elsewhere. She holds a B.A. from Sarah Lawrence and an M.A. from Goddard. A Virginia transplant, Easter re-rooted at Minnesota’s Carleton College. Now emerita professor of dance, veteran dancer/choreographer, her chapbook is Walking From Origins. Honors include Bush Artist Fellowship; multiple McKnights; The Loft Creative Non-Fiction Award; Ragdale and Anderson Center residencies. DO I STILL GOT IT. Candice Iloh is a poet, creative writer, and educator residing in Brooklyn, NY whose work has appeared in Insight Magazine, Blackberry Magazine, and the Fjords Review. She is a Voices of Our Nation Arts Foundation Alum and the Managing Editor of Quiet Lunch Magazine. When she is not writing or working with young people, she dances. Originally from Kingston, Jamaica, Shara McCallum is the author of four books of poetry: The Face of Water: New and Selected Poems (Peepal Tree Press, UK, 2011); This Strange Land (Alice James Books, US, 2011), a finalist for the OCM Bocas Prize for Caribbean Literature; Song of Thieves (University of Pittsburgh Press, US, 2003); and The Water Between Us (University of Pittsburgh Press, US, 1999), winner of the Agnes Lynch Starrett Prize for Poetry. Her fifth book, Madwoman, is forthcoming from Alice James Books in 2017. Recognition for her poetry includes a Witter Bynner Fellowship from the Library of Congress and a National Endowment for the Arts Poetry Fellowship, among other awards. Her poems and personal essays have been published in literary magazines, anthologies, and textbooks in the US, the UK, the Caribbean, Latin America, and Israel and have been translated into Spanish, French, and Romanian. McCallum has served as faculty in the MFA programs at the University of Memphis, Stonecoast Low Residency, and Drew Low Residency. Since 2003, McCallum has been the Director of the Stadler Center for Poetry at Bucknell University, where she is also a Professor of creative writing and literature. Kyla Marshell’s poems and prose have appeared in Gawker, SPOOK magazine, Blackbird, Vinyl Poetry, The Guardian, and elsewhere. She earned a bachelor’s degree in English from Spelman College, and an MFA in Creative Writing from Sarah Lawrence College. She is a graduate of the Cave Canem retreat, as well as their social media manager. She lives in New York and keeps a second home at kylamarshell.com. Nate Marshall is a poet and educator from the South Side of Chicago. He is the editor of The BreakBeat Poets: New American Poetry in the Age of Hip-Hop. His first book, Wild Hundreds, won the Agnes Lynch Starrett Prize and is forthcoming from the University of Pittsburgh Press. He serves as a Zell Postgraduate Fellow at the University of Michigan. A Cave Canem Fellow, his work has appeared in POETRY Magazine, The New Republic, and elsewhere. Nate won the 2014 Hurston/Wright Founding Members Award and the 2013 Gwendolyn Brooks Open Mic Award. He is a founding member of the poetry collective Dark Noise. He is also a rapper. Ashley M. Jones is a John S. and James L. Knight Fellow in Poetry in the Creative Writing MFA program at Florida International University. She is originally from Birmingham, Alabama, and she was recognized in 2014's Poets and Writers Maureen Egen Writer's Exchange Contest. Her work has been published or is forthcoming in Night Owl, The Harvard Journal of African American Public Policy, pluck!, Valley Voices: New York School Edition, and Fjords Review: Black American Edition. She currently serves as the Official Poet for the City of Sunrise's Little Free Libraries Initiative. A recipient of fellowships to the Cave Canem Foundation, the Prague Summer Writing Institute, the Fine Arts Work Center Walker Fellowship and the Vermont Studio Center, Kamilah Aisha Moon's work has been featured widely, including Harvard Review, jubilat, Poem-A-Day for the Academy of American Poets, Oxford American, Callaloo, Villanelles and Gathering Ground. A Pushcart Prize winner, she was also a finalist for the Lambda Literary Award and the Audre Lorde Award from the Publishing Triangle. The author of She Has a Name (Four Way Books), Moon holds an MFA in Creative Writing from Sarah Lawrence College. Cynthia Manick is a Pushcart Prize nominated poet with a MFA in Creative Writing from the New School. She has received fellowships from Cave Canem, The Hambidge Center for the Creative Arts & Sciences, the Callaloo Creative Writing Workshop, Hedgebrook, and the Vermont Studio Center. She serves as East Coast Editor of the independent press Jamii Publishing and was a 2014 finalist for the New York Foundation of the Arts Fellowship in Poetry. Manick’s work has appeared in African American Review, Callaloo, DMQ Review, Human Equity Through Art (HEArt), Kinfolks Quarterly, Kweli Journal, Muzzle Magazine, Obsidian: Literature in the African Diaspora, Pedestal Magazine, Passages North, PLUCK!, Spillway Magazine, Tidal Basin Review, and elsewhere. She currently curates Soul Sister Revue and resides in Brooklyn, New York. 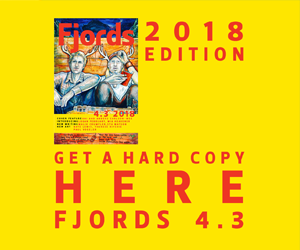 © 2018 FJORDS REVIEW. ALL RIGHTS RESERVED.